Copyright Ó 1997-2001 Reed Kotler Systems, Inc.
First select the folder that you installed the Transkriber in and double click on it. The folder will open up and then you can double click on the Transkriber application. A list of programs will come up to the right . The Transkriber main panel will come up now. The Transkriber comes with it’s own method of making recordings. Before going into that I will just point out that there is a better way whereby you can use digital extraction tools. There are free and commercial versions of these tools. We cannot distribute them but can tell you how to get them. To record within the Transkriber, follow the directions below. Place an audio CD in the CDROM player of your machine. The CD will begin playing. You can double click on the CD icon on your desktop and then the track you want to record. Now cue up the CD player to where you want to record from and then pause the CD player right before where you want to start recording. Make sure there is no file currently open on the Transkriber. If there is, then select File->Close. Select Record. This will bring up the record panel. Click on Record and then un-pause the playback using the CD icon on the bottom of your Mac. (It pops up and has a list of things you can do followed by the list of tracks.). Select “Play”. When you are done recording, click on stop from the Transkriber record panel. You may need to change some settings in the sound control panel. (These adjustments can also be made using the sound panel icon on the bottom row of the mac). If you record and then there is no sound, then you machine is not enabled to record from the CD player. If the sound is strange, then it may have recorded from the microphone. You can adjust this by selecting Internal CD player as the input device and adjusting the sound level appropriately. This is the playback volume control. To switch to the recording volume control, we selection options-> properties. Notice that now a new mixer control labeled "Recording Control" appears. It looks like the "Volume Control" we saw earlier. The most basic playback buttons are the "Home", "Play", "Pause", "Stop", "End" buttons. These are in the center of the main Transkriber panel. There are also some basic indicators that tell you where you are within the music you are playing back. "Current Position" on the left tells you how many seconds into the recording the playback is at. Now try playing some music by pressing the "Play" button. Notice that the "Play" button turns into a "Stop" button once you press it. Of course there is already another "Stop" button on this row of buttons but you would have to move your mouse over there to press it. By having the "Play" button turn into the "Stop" button we are able to allow you to "Stop" the playback without having to move the mouse. Since this is a very common thing to want to do, we make things easier by doing that. When we stop playback by pressing either "Stop" button, the "Play" button reappears. Try pressing "Play" followed by "Stop" this a few times. Try the different "Stop" buttons and you'll see why we have the "Play" button behave the way it does. When you press "Stop", the current position returns to the beginning of the recording. In actual fact, it returns to the beginning of the current playback region. When you first record or open a saved file, the playback region consists of all the recorded music. During playback, you may pause the playback by pressing the "Pause" button. Notice that the "Pause" button turns into the "Resume" button . Pressing the "Resume" button causes the playback to resume and the button to turn back into "Pause". Try some more playback using "Pause" and "Resume". The current playback position can also be seen by looking at the position of the slider. When the playback is stopped or paused, you can change to current position by several means. You can place your mouse on the slider and drag it to the desired location. You'll notice that the current position is changed accordingly. For example, you may drag the slider to the center position to set the current position at half way through the playback region. You may also adjust the slider by either clicking on the arrows on the left or rightmost part of the slider or on the left and right arrow buttons on the center strip of buttons . As you use the transkriber a lot, you'll appreciate have the various functions at convenient places that you can reach without a lot of mouse movement. The "Home" button moves the current position to the beginning of the playback region and the "End" button moves it to the end. Try playing around with some of these various functions before continuing. The speed at which the Transkriber plays back is controlled by the speed section of the Transkriber main panel. There are several methods available for changing the speed. 1) There is a drop down box, which initially reads "Full". By pressing the down array, the list of speed "presets" is shown. By using the scroll buttons, you can look through the list of speed presets. By clicking on any of them you choose that to be the current playback speed. For example, try selecting 3/4 and then playing back. Try others. The current playback is always under the word "Speed". As we shall learn later, it is possible to create your own "presets" and use them instead of the one built in ones that come with the Transkriber. You will notice that you can change the speed even during playback. 2) You may cycle through the preset speeds by using the "<" and ">" under the speed. Pressing "<" chooses the next slower preset and ">" choose the next faster preset. If you press "<" at the slowest speed it will move to the fastest speed and "> at the fastest speed will move to the slowest speed. 3) At any time, you may return to full speed by pressing the "Full" button. 4) You may select any speed and type in the value by entering the speed into the box below the "<" ">" keys. For example, enter .5 and then hit the "enter" key to playback at half speed. The present closest to this speed will appear below the "Speed" with a + or - to reflect whether it is above or faster or slower than the preset value. For example, if you enter .51, it will show 1/2 speed with a + sign next to it. You must hit the enter key for the number you type in to take effect. This may also be done during playback. 5) You can adjust the speed up or down by .1 increments by using the up and down arrows next to the speed entry box. 6) Another way to change the speed is by speed up or down by a percentage change. Clicking on the appropriate button does this. You may create your own preset speeds by creating a speed-preset file using Microsoft notepad. The built in one is in a file called Transkriber.sp and has the following contents. Each line has a numeric value which is the reciprocal of the speed (7 for 1/7) followed by the text that is displayed. You may create your own preset file and change from the built in one by using the "Load Presets" button. That will prompt you for an alternate preset file. You may change the pitch of the playback, adjusting it by semitones (half steps) or cents (hundredths of a semitone). We allow you to adjust up or down 12 semitones and up or down 100 cents. You may also return to no pitch change by clicking on "Reset". The number next to Half Step or Cents indicates the current state of key change. 1) You want to play along with the music in a different key. Possibly you are a singer and you want the playback in a more comfortable key for your voice or perhaps you are an instrumentalist and want to practice the song in different keys. 2) You are transcribing music, which might cause you to need to retune your instrument. For example, some guitarists tune their guitar down by one or more half steps. By adjust the key up several half steps, you don’t' have to retune your guitar to play along. 1) Your recording (or your instrument) may be out of tune with one another. Sometimes on old recordings this can be particularly significant. 2) In different parts of the world, the tunings may vary. So a recording made in Europe will no be in tune with one made in the USA. 3) People specializing in Baroque period music may tune differently. This adjustment allows for you and the recording to be in tune. Try playing back the music and doing some pitch adjustments. Unless you have a really good ear, you will need at least 10 cents difference before your ear will start to detect a difference. Change by half steps will be much more obvious. Normally when we are transcribing, we want to focus on one section at a time. This one section we call the playback region. This is one of the more important parts of the transcriber. The numbers next to From and To define the boundaries of the playback region. In the above sample, the playback region is from 0 seconds (the beginning of the recording) to 40.12 seconds (in this case it happens to be the end of the recording). When a new piece is recorded or a file is opened, the playback region is from the beginning to the end of the recorded music. There are several different ways to define a playback region. The simplest is to do it while listening to the music. During playback, you can click on the numbers (0.0 or 40.12) and those numbers will change to the value in the Current Position window. Try this out. You can always reset the left edge, right edge or both edges to their initial position by clicking on the reset button. Anytime, even when playback is stopped, the numbered buttons next to From and To will be changed to the value in the current position window. This means that while playback is stopped or paused, you can use the slider above the main row of buttons to change the current position and then click on the numbered button next to From or To to change the playback region boundaries. To adjust the left or right boundary of the playback region, you may click on the left or right arrows next to the number. Clicking with the left button mouse button will cause the amount to change by .1 second increments and clicking on the left button will cause it to change by .01 second increments. The whole playback region may be moved left or right by using the "move fine" or "move coarse" functions. A selection marks a particular region of time that the Transkriber is set to play back. It plays the region marked by "From" to "To". This region may be changed. The beginning of the selection may be moved forward or backward in time by using the arrow keys next to it. Similarly the end of the selection may be moved forward or backward in time by using the arrow keys next to it. Clicking on the arrows with the left mouse button will move the time in .1 second increments. Clicking on the arrows with the right mouse button will move the time in .01 second increments. The entire selection may be moved left or right with the arrow keys in the move box. "Fine" and "Coarse" move it by larger or smaller amounts. By right clicking on "Fine", you can move it by even smaller amounts. If you want to reset the right or left edge of the selection (or both edges), you can use the "Reset" button that is in the selection area. It will pop up with a list of choices. When the Transkriber reaches the end of a selection, it normally will stop. You can cause it to loop in several fashions. By clicking on "Loop", it will by default replay the selection when it reaches the end. You may also cause it to pause each time it reaches the end of the loop by some number of seconds by clicking on the drop down box. If you are playing along with a riff for example, that gives you enough time to prepare. Sometimes though, you don't want to play with the riff, but rather after it. So then you want it to dealy an extra "whole loops" worth so you have time to play it before it repeats. You achieve this additional delay by clicking the box next to "+Loop". Sometimes you might want to remember a particular playback region. For example, you might want to go back at a later time and re-check your transcription of that part. You can remember a playback region (selection) by pressing the remember button. You may optionally give a name to the selection for future easy in finding it. You can name the selection by enterring into the text box. For example, you can save the lick 1. The "Selections Box" will pop up and save this setting of the playback region. The range of values, 6.29 to 10.48 is the From/To pair in the playback.These selections become associated with the wave file and will be remembered the next time the wave file is opened. Sometimes you want to focus on a particular note (or chord) within a selection. You can do this by using the note grabber. You initially set the position of the note grabber by clicking on the "Grab" button. This can be done while the Transkriber is playing or while it is stopped. It will be set to the current position in the playback. Once set, the note may be played by clicking the "Play" button that is within the note grabber section. By default, the note is one second in length. The note may be lengthened or shortened by using the arrows next to less/more. The note may be moved forward or backward in time by using the arrows next to "Left/Right". The note may be looped with or without delay between each time the note is played by using the "loop" and delay drop down box. Similarly, a particular note (usually a chord), may be saved by using the "Remember" key. This allows you to go back later and listen to that some more. The playback of the note will also be affected by the normal playback speed. For figuring out chords, you can place a small loop around the chord and then play it back at a slow speed, possibly adding looping to make it continuous and/or delay to give you time for it to register in your mind before hearing it again. There is an interesting way you can use the note grabber as a normal method in tandem with the main selection control. As you move the note grabber to the right, the main selection will track along with it. That way you can keep working on adding one note at a time, figure that note out, and still be able to hear the larger phrase. Most professional transcribers I have known, transcribe away from their instrument. The instrument is only used to check the transcription and of course to play it. There are lots of reasons for this but mostly it is quicker method and leads to more accurate transcriptions. For this reason, we provide a way for one to hear a note with the transcriber without having to go to your instrument. In the past, most of us used a tuning fork or pitch pipe to get the proper pitch. In the Transkriber, we provide a pitch reference control to aid in this. A single octave is visible at a time. The black keys are notated with # or b depending on the selection or # or b above. Adjusting the up/down arrows on the far left may make the octave higher or lower. In the lower left hand corner. The midi instrument is selected by using the pull down menu. If you wish to hear the instrument as you scroll through the various patches, click the "preview" on. The volume of the preview may be adjusted with the slider to the left of the word "preview". You can use this to check any note you hear from the main selection or the note grabber. Some computers have several MIDI output devices, some of which make no sound on your actual machine but require the hookup of an external synthesizer. If you hear no sound from the pitch reference, then you may need to select another midi output device. This is option is under "options"-> "select midi output device". This is a multi function part of the Transkriber. We describe this functionality when used with a stereo recording first and later will discuss ramifications when using a mono recording. By clicking the L or R, it will remove the left or right channel from playback. By itself, this would have the sound come out of only one speaker (or side of your headphones). To more finely adjust the amount of left and right, you can use the slider. To return the slider to it's center position, click on the square button below it. The left and right channel can be mixed together and the result played on both channels by clicking on "Mix". This helps to create better mixes for transcribing. For example, the instrument you are transcribing may be better heard on the left or right channel. It might be sufficient to just click the other channel off. Sometimes the separation is so severe that you are only left hearing one instrument and can't hear the rest of the band. In this case you might want to mostly hear one channel but still hear the other but then hear the channels mixed together. You have to experiment with this feature. On a stereo pop recording, the lead singer or instrument is usually mixed in the center of the recording with other band members to the side. This gives the illusion that there is a whole band in front of you. If you have the balance control slider in the center and click lead vocal/cancel, it will eliminate most of the lead instrument or vocals. On jazz recordings, the lead instrument is not always in the center. If you move the balance slider to the left or right you should be able to find that instrument and cancel them out. The volume slider is the master volume control. Our volume slider can be used to eliminate digital clipping, which occasionally can be introduced, by using the balance/cancel controls. You can also use the volume control on the built in Microsoft volume control but this will not eliminate any unwanted digital clipping. If you want all your wave files to be of roughly the same volume, you can use the normalize button. This will change the wave to be roughly at maximum volume. Then you can save the file. In most cases you won't need this. If you record something too soft, this will also bring up the overall volume. This should in general not be used but may be helpful on some recordings. For guitar and instruments with a short attack, you want fine resolution and for instruments like saxophone that have a big sound envelope, you might want more coarse resolution. 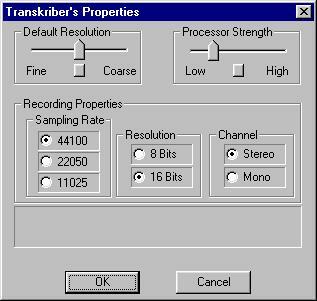 The Transkriber will remember this setting for this particular recording the next time you load this sound file. To reset it to its nominal value, click the button below the slider. We shall also see later that using the Transcriber's property menu, you can change the default resolution. You may find one that works best for most of what you are transcribing. By clicking the "Output to File" box in the upper left-hand corner, the Transkriber will write the output to a file. Whatever you hear will go to the file. This window is launched by selecting "File" -> "Remembered Selections". This window is launched by selecting "File" -> "Properties". Processor stength is not currently used. Do not use Default Resolution unless you really understand the use of the resolution on the main Transkriber panel. There are misc. options available. There is an alternate slowdown method that the Transkriber can use. This is primarily for use on a very old machine that may not have enough horsepower for the Transcribers newer sound engine. "Select MIDI Output Device" allows you to change the MIDI device used by the Transkriber for playing notes in the pitch reference and instrument controls. Most machines have several midi devices and some are meant for connection to an external synthesizer so they might make no sound.